The Feuerbach, or “River of Fire” in German, shoots auto-propelled projectiles. These small, lightweight projectiles have a quick loading and boosting mechanism that provides a rapid rate of fire. 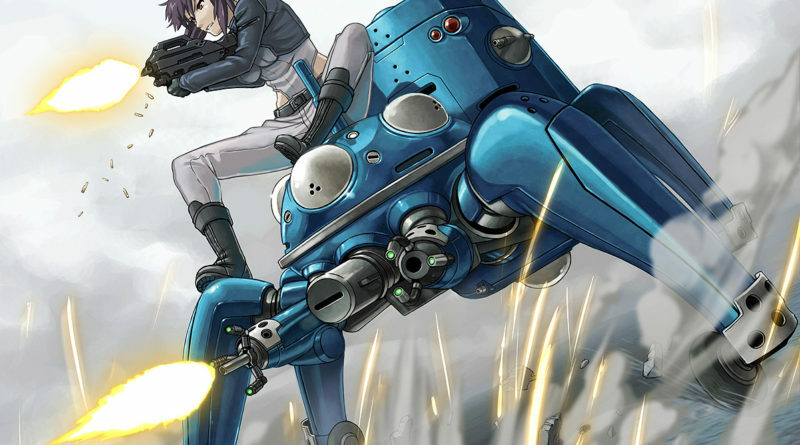 In exchange for this, the Feuerbach sacrifices destructive capacity compared to other Anti-Tank weapons, which tend to be more powerful but slower. However, the advantages of a faster rate of fire are evident, and the main reason for its success in military circles, where there only are positive comments about the weapon. The Feuerbach is patented by FGA (Franco-Germanique Armements) and licensed to producers in different countries. Those brands commercialize the original patent with modifications to the optical and firing systems. Although officially its denomination derives from its rate of fire and destructive capacity, it is rumored that the real origin of the names comes from the fondness of its designer for German philosophers of the Nineteenth century. I arrived in my FLGS 30 minutes late for game night and was fully prepared to just sit around and provide unsolicited color commentary for other folks’ games. 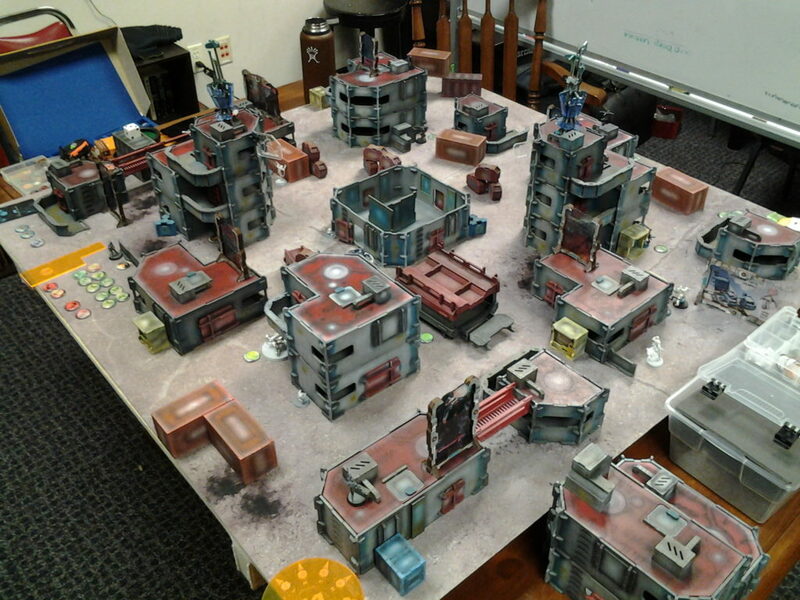 As it turned out, they had just finished setting up a beautifully painted table and the table’s owner was looking to play someone other than PanO, so that meant me! Our PanO player faced off against our USARF player instead (who also was running late), so everyone got a game in. Hooray! Big thanks to my opponent for bringing in his beautifully painted table and setting it up! My phone melted itself and the new one hadn’t arrived in the mail yet, so I wasn’t about to take any pictures, but then I remembered that I had an ancient tablet in my model bag halfway through the game. The below picture is from the top of turn 2, but gives the layout of the table from my perspective so you have a reference for where things were. 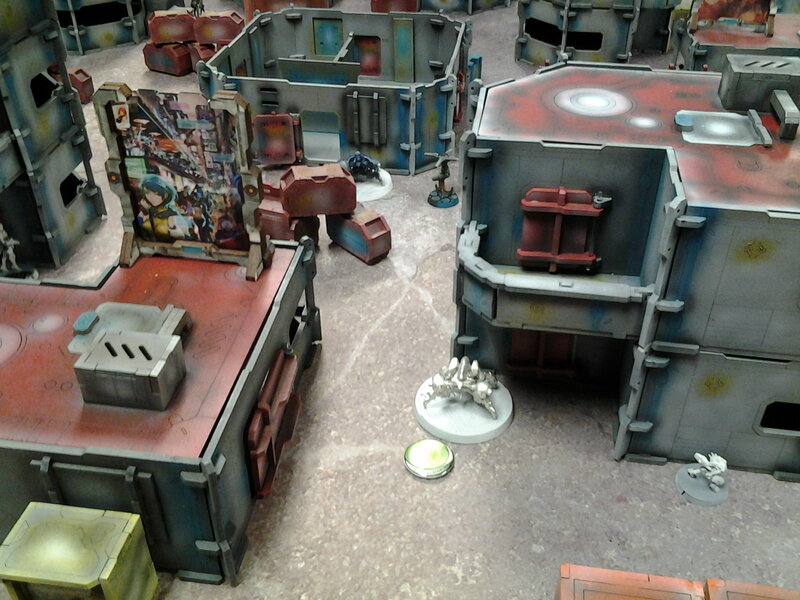 His deployment was pretty straightforward, an Ikadron on both sides, and a pair of Ímetrons, one of which scattered way back into his deployment zone onto a building, and the other which scattered to right outside my deployment zone on the way to the Armory. Excellent, Lunokhod food! He stuck his Rodok link team with Legate behind the tall building in my far right quadrant, with a Nexus hacker all the way in the back on the same side. 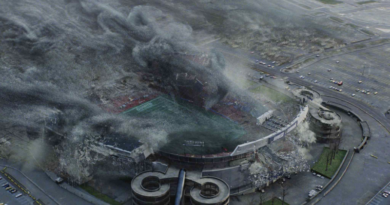 The Noctifier came down as a TO camo token atop the tall building on my left, with the Q-Drone below it, ready to race up the field. 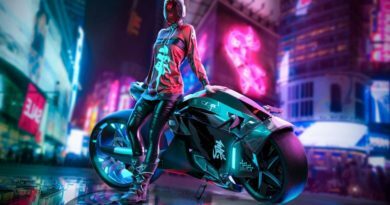 His Maakrep watched both sides of the armory from the building in the middle of his backfield, behind the holographic advertisement. Dr. Worm is tucked into the small building next to the rectangular shipping crate slightly to my right of the Noctifier. I did my best to cover the Q-Drone with two Jaguar Panzerfausts, but there wasn’t an easy way that didn’t grant the Noctifier a shot against me out of cover, so I settled for putting them on two different buildings to contest the Q-Drone’s advance over two orders. Of course this mean they’d both die over the course of those two orders, but there’s always a chance that I catch it the open with a lucky panzerfaust. The first Jaguar came down on the catwalk, right near the unloaded token in the picture above, and the second Jaguar poked out a little from behind the holographic advertisement on the building in the middle of my deployment zone. My Tsyklon Feurbach overwatched the Rodok’s approach from the corner of middle building, and the Lunokhod started where the Tsyklon (unpainted) is now. Mr. Moran is scooted up to the edge of the exclusion zone with his Crazy Koalas. Good old Intruder MSR is out of frame, covering the right to left diagonal of the board. My Moira E/M LGL started atop the super tall building just outside my deployment zone, tucked into the alcove on the large roof which was just barely inside my deployment zone. Beneath the Moria is the Riot Grrl BSG, tucked under the balconies. 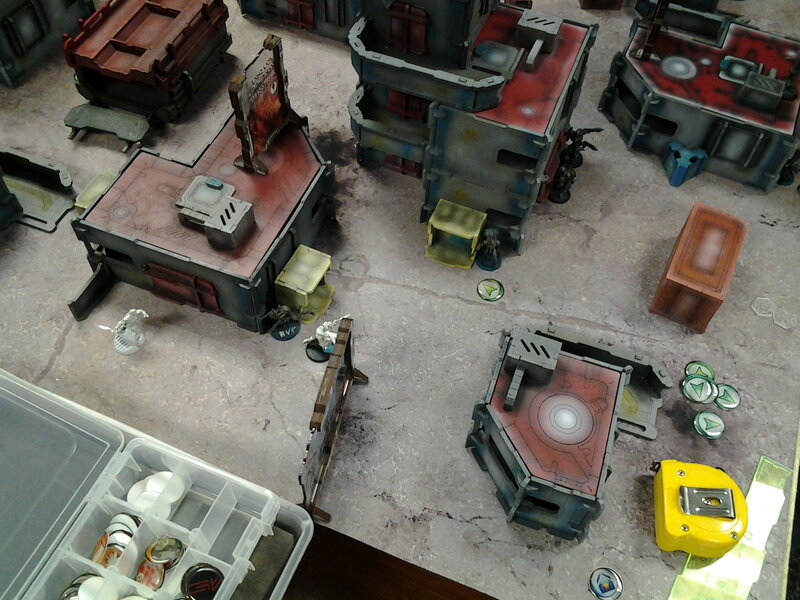 I hide my Interventor in the shipping containers at the back right of the table, and my Morlocks and Krakots are deployed in pairs on either side of the board, one to each side. He starts by trying to remove my Jaguars to unpin his link team. His tool of choice, the Maakrep MSR, which is a quite reasonable choice. Unfortunately for him, my left Jaguar rolls a crit and pastes his Maakrep sniper off the board. He buffs the Q-Drone and opens up on my left Jaguar. We both miss, but now I’m out of panzerfausts. He rolls the Q-Drone up to get LoF on the second Jaguar, managing to take it out while my first Jaguar whiffs with a long range ADHL shot. I’ve got excellent coverage of the link team’s most direct route to the Armory with the Intruder and the Tsyklon, including the place where the Q-Drone would have to be to fight them off. Zero Cool pulsed a short, encrypted text transmission to the Nomad strike team. Remember, this time, we have to get something more useful than old MSV tech from this Yu Jing installation. Don’t rush it, slow is smooth and smooth is – “¡Mierda! Contact!” interrupted Araña, snap-firing a panzerfaust downrange. The holographic ad he had been looking at turned red with gore briefly before fizzling out in a spectacular spray of sparks. “What the hell was that!” Zero Cool spluttered. “It looked like those artichoke guys, but with cooler horns!” responded Araña, flippantly. “Oh damn. Combined. Lock this place down!” demanded the Interventor. A Tsyklon REM detached itself nimbly from the alcove it had been hiding in and broke cover, optics scanning for threats. He decides to chance it and throws the Legate and a Rodok Paramedic into the open. I shoot the Rodok, who’s the link leader, with the Tsyklon and waffle a bit on whether or not I should reveal the Intruder. Normal rolls on a possible Lieutenant profile are too good to pass up, so I throw an MSR shot at the Legate with the Intruder. To protect both units, he declares dodge. The Tsyklon pastes the Rodok with the Feuerbach and the Intruder puts a wound on the Legate, sending it into NWI. My opponent needs to remove the Tsyklon, so he finds an angle where only the Tsyklon can see and blasts away with the Q-Drone. 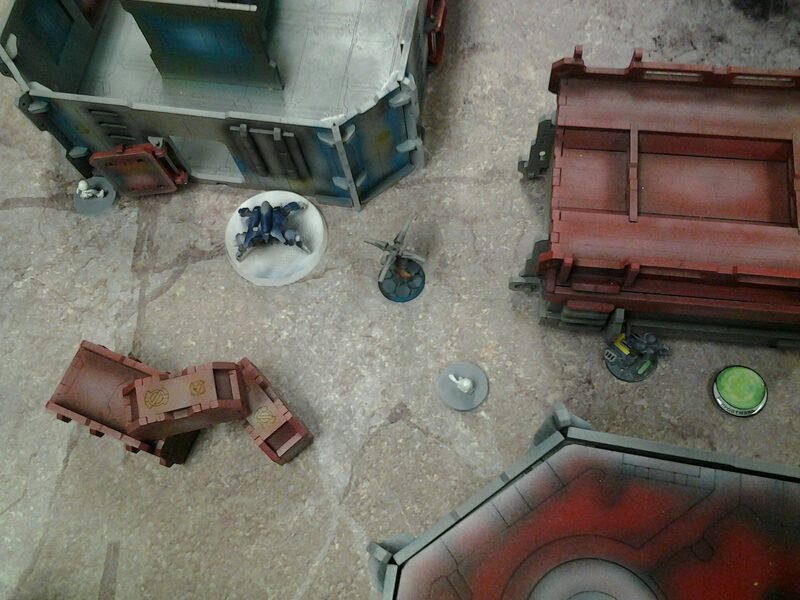 The Tsyklon is rolling some hot dice this game and drops the Q-Drone into unconscious 2. The Umbra Legate is out of LoF of the Tsyklon, but is in the open versus the Intruder. He tries to get it out of the way by move-dodging again, but the Intruder needs 16’s… It doesn’t end well for the Legate. With his last few orders he rolls the Ikadrons up the table a little to get them in position for his next turn. As if on queue, a small team of Rodoks and an Umbra Legate dashed across the Tsyklon’s field of view. Its Feuerbach spooled up and sprayed out a stream of explosive projectiles, turning the sprinting Morat into a fine mist. A sharper crack-crack punctuated the cacophony as two anti-material rounds from the Intruder’s sniper rifle spun the Legate around and sprawled it to the ground, most of its torso missing. In answer, a searing stream of sun-bright plasma streaked across the open field, splashing superheated gas across the HVAC unit the Intruder had taken cover behind, slagging the heat exchanger’s fins. The Tsyklon traversed its twin-barreled weapon and let loose another stream of rounds, tearing huge gouges out of the Q-Drone’s scant armor and twisting its motive mechanisms asunder. The force of the repeated concussive blasts hammered the Q-Drone into the ground, taking its deadly plasma projector out of the fight. I’m in an excellent position now, with his link team broken and the remnants pinned behind a building by my Intruder and Tsyklon. I want to get into the Armory this turn if I can, and remove as many threats as I can, but that Noctifier is troublesome. Also, the Tsyklon is just out of 32″ against his Rodoks, and I really want to be in good rangebands to negate their Mimetism (like I said, I rolled crazy good on the Tsyklon). Speaking of rolling well, I rolled 8-4 MOV on my right Morlock, so she and her Krakot buddy just jet up the right flank, out of LoF of the Noctifier and under the cover of smoke. The warbands on my left flank are a little slower, but shuffle their way towards the Noctifier and its Ikadron backup. Now under the cover of smoke, my remaining Jaguar spends his Frenzy order and dashes up the catwalk to get a better angle into my opponent’s deployment zone. I fill the Jaguar-sized hole in my first order pool by stealing his Ímetron with my Lunokhod on the way to the Armory. I scoot the Tsyklon into the Lunokhod’s old position, meaning it now has good rangebands to the Rodok link should they choose to come around the corner. I use the same order to open the Armory door the old fashioned way, by shooting it with the Feuerbach. 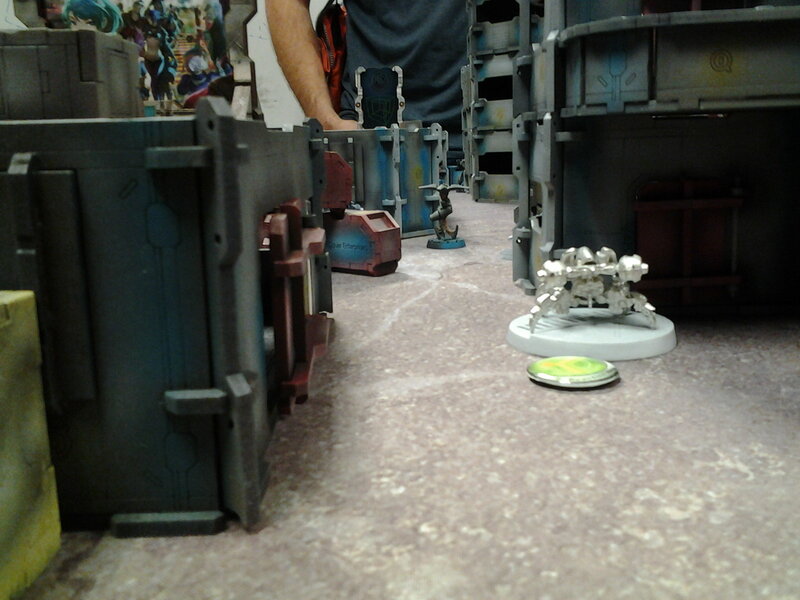 Zero Cool plotted some waypoints for his attack REMs with few deft flicks of his wrist and jogged towards the Yu Jing armory building. Activated by Zero Cool’s orders, the Lunokhod scuttles forward. The REM paused briefly to fire a small comms module at the nearby Ímetron. As the Lunokhod vacated its position and the Tsyklon settled into place behind it, a new stream of data started scrolling across Zero Cool’s HUD detailing the placement and disposition of the Combined Army forces. “I’ve tapped into their comms network, uploading positioning information to you now,” he informed the rest of the team. An intermittent blip appeared on his display. Frowning under his visor, Zero Cool blinked at it, but no additional data is forthcoming. “There’s something atop that building,” said the Moran. “I’m going check it out.” The Moran and his attendant robots loped ahead, only to disappear in a concussive blast of light and sound. “Well, that’s a missile launcher,” reported the Intruder, dryly. I get greedy and try to box his link team in with the Moran’s Crazy Koalas, but I overextend and the Noctifier punishes my hubris by turning the Moran into a red mist. Now that the Noctifier is revealed and behind smoke from my left Morlock, I scoot the Reverend Moria forward into cover and attempt to spec-fire an E/M grenade onto it. Kind of a waste of an order, in retrospect. I think I got distracted by the shiny E/M grenades. Shiny! The Noctifier still has an angle on my Riot Grrl, so I can’t get her into the armory this turn. I take a risk and move my Interventor Lt up the field. The Armory protects him from the Noctifier, and if the Rodoks want to come after him, they have to contend with an Tsyklon and an Intruder if they come around the left side of the building (my perspective) and a Krakot, Morlock, and the Intruder if they want to come around the right. I feel like I’ve got them pretty well boxed in so I just take the risk and spend my lieutenant order and buff the Tsyklon to have burst 2 in ARO. Well, turns out the Legate was his Lieutenant, so he’s in loss of lieutenant. The Rodoks don’t care and he hasn’t spent any command tokens yet, so he’s got a potentially productive turn ahead of him. He tries to break his Rodoks free by flamethrowering my Krakot at point blank range, but I successfully engage. The Ikadron on the left attempts to flash pulse the Moira, now that the smoke has cleared, and actually manages a hit in spite of the ODD and cover! I barely pass BTS, and breathe a sigh of relief. 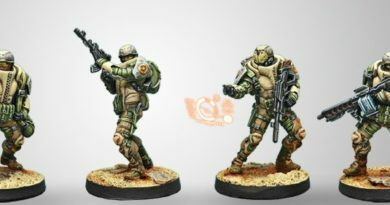 He reforms the link, and attempts to remove the Tsyklon with a combi-rifle. It does not go well. The Noctifier spends its order and tries to shoot the Moira, but we both whiff due to our ODD and TO. He’s down to two Rodoks, a pair of Ikadrons, a Noctifier, Nexus hacker, and Dr. Worm. He needs to get into the armory, and chooses his link team as the guys that are going to do it. Dr. Worm does some truly fancy cautious movement footwork and manages to make it to the Rodok’s side of the table with his remaining orders. The Krakot smushes the Ikadron in CC, electing to not use Berserk and get automatically electric pulsed. The Morlock on the right rockets up the field with his 8-4 MOV and chain-rifles the remnants of the Rodok link, only dropping one of the two remaining Rodoks and getting blown off the table by the Noctifier. The Morlock on the left smokes out the left Ikadron so my Krakot can super jump and attempt to take out the Noctifier. I am bad at super jumping and the Noctifier drops another warband. “Sister, that missile launcher needs to go away,” requested Zero Cool. In answer, the Reverend Moira snapped her MULTI Rifle up and mag dumped into the general vicinity of the Noctifier. A missile came rocketing back at her, but she sidestepped it with aplomb, taking the brief pause to effect a lightning-fast magazine change. A second prolonged burst finally found a home in the Noctifier’s chest, pitching the alien off the roof to its doom, a final missile spiraling harmlessly away into the sky. “Thank you!” sing-songed Zero Cool as he rifled through the goodies in the armory, soon to be joined in his quest by a Riot Grrl. I remember to play to the objective and scoot my lieutenant into the armory, grabbing something from the nearest panoply and going into suppression. I’ve got a few more orders left, so I spend most of them crit-fishing with the Moria’s MULTI Rifle against the Noctifier. Eventually I get the crit I’m looking for (but not the droids, turns out they weren’t the ones I was looking for), and this frees my Riot Grrl to dash into the Armory with my remaining orders. Dr. Worm doctors up a Rodok for his classified. The left Ikadron tries to flash pulse my left Jaguar but gets glued and E/M grenaded for its trouble. He fails his PH but passes his BTS, so at least he still generates an order! The Krakot runs around the corner and chain rifles everything because… chain rifles, and I throw away the rest of my orders. I’ve dominated the Armory for 2 turns, have it at the end of the game, and have gotten more goodies out of the panoplies. That was a very one-sided game. I think I had all the right pieces in the right places, and the dice gods were very kind to me with the Tsyklon’s performance and the first BS roll of the game crit against the Maakrep. I had considered putting both Jaguars next to one another to force him to split burst with his Q-drone, but was (rightfully) afraid of the TO camo marker. The Tsyklon performed amazingly well this game, but it was covering an extremely narrow firelane that could be cautious moved through, were it not for the Intruder. My warbands were equally good, collapsing his left flank (my right) and containing his Rodok link. Really I wanted to get the Krakot up there but there was no good way of doing it without taking a bajillion orders so I took the risk of using its impetuous order… didn’t work. I definitely wasted a few orders trying to spec-fire things with the Moria’s E/M launcher. I should’ve getting my Lieutenant into the armory sooner and rolling the Lunokhod up to lock down the Rodoks further. Having it there would have prevented the Zoidberg scuttle from Dr. Worm too. 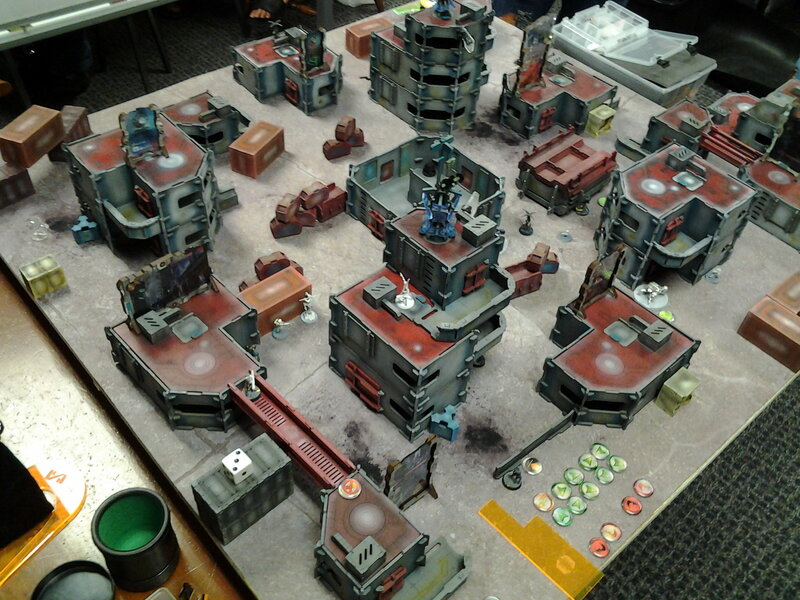 The table was really tall with some very tall buildings available in our deployment zones. There were also a few DZ-to-DZ firelanes that I took advantage of, even in spite of the Armory’s infinite height. I think that’s what won me the game, really, was choosing the side with the best firing angles. The Maakrep could’ve contested the same firelane as my Tsyklon, which would’ve locked down my movement towards the Armory in conjunction with the Noctifier. Losing the Maakrep really hurt, but burst two versus burst 1 can be risky. Dodging with the Legate and the Rodok was very very risky. He could’ve shot down the Tsyklon with a linked spitfire and thus cleared the way to the Armory (and probably dealt with the Intruder in the process too). The Q-Drone play was probably fine, the dice just didn’t work out.